I love Carly and Ben’s wedding album. The cover is so simple and clean and showcases the beautiful portrait of the two of them. And, I especially love the silver gilding and lettering. Black and silver is one of my favorite color combinations. 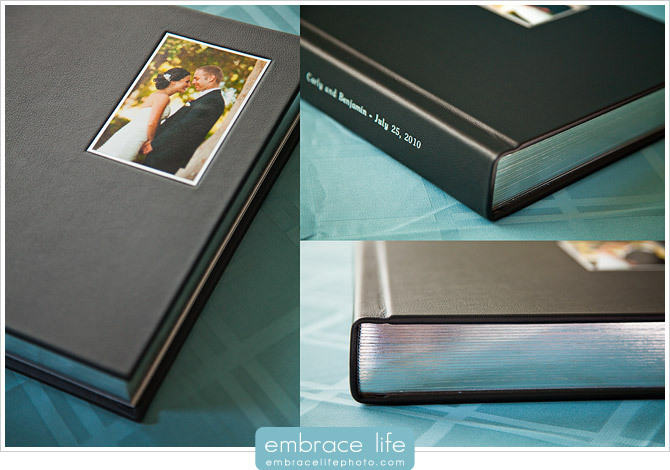 =) They chose a black leather, Hand Crafted Elegant Album with white mats and ivory liner. Everything they picked worked together perfectly. And, you can tell just from flipping through this album, how much family and friends mean to them. It was a great celebration and we were honored to be a part of it. If you missed our previous blog post, you can check out more of Carly and Ben’s wedding here. We can’t possibly thank Adam and Embrace Life enough for our absolutely AMAZING wedding album! Watching that video gave me chills – and I’ve easily gone through our album a hundred times. We wish we could do it all over again!! !